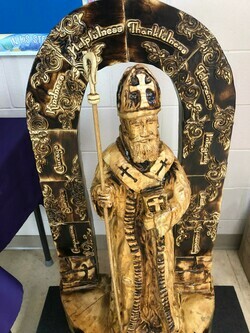 In our 2015-2016 school year, our school community chose Saint Nicholas as our school’s Patron Saint. St. Nicholas, also known as the Bishop of Myra, is well known for his patronage of children, sick, afflicted, suffering, and disabled people. He is a prompt healer and a true consoler. Jean Vanier Catholic School opened in 1974. It was named in honour of Jean Vanier, the founder of the L’Arche movement, and the son of former Governor General of Canada, George Vanier. In 1964 Jean Vanier, a philosophy teacher and theological student decided to share a home in the village of Trosly-Breuil, north of Paris France, with two mentally challenged men. In welcoming them, he wanted to give them a home where they could live in dignity and grow in every spiritual and human dimension. At that time it was not foreseen that a worldwide movement would develop from the tiny home that he had christened L'Arche, or "the ARK". L'Arche is now a network of more than one hundred communities in thirty countries inhabited by people with disabilities and their caregivers. Their goal is to achieve a sense of community and dignity not possible within an institution. Today, we continue to welcome and celebrate our connection with L’Arche, welcoming and inviting our friends from L’Arche as often as possible to our school community. Jean Vanier Catholic School is an English and Ukrainian Bilingual Pre-K- Grade 4 elementary school within Elk Island Catholic School District. All students learn and grow together in our inclusive classroom environments. Our Learning Support teams are committed to providing quality learning environments for all; including any of our students who require additional support, accommodations, and programming for their learning needs. When I pause, I put myself in a new or different environment. When I pause, I create spaces–or sanctuaries–where renewal is born. When I pause, I allow my soul to savor, relish, value, honor, welcome, see, celebrate, wonder, and to experience grace.